Efficient name to involve in offering the optimum quality of Writing with the pencil and also improves writing skills. 0 Attractive designs with fluorescent colours for cheerful writing. 0 Super black lead for dark handwriting. 0 Soft wood for easy sharpening. 0 Meets International quality standards. 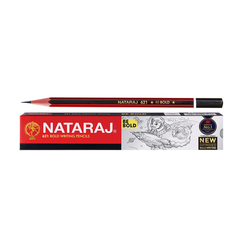 As a reckoned business firm, we are immersed in offering to our patrons an inclusive variety of Natraj 621 Pencil. Beneath the direction of hard-working executives, these are designed at par with the prevailing market trends and developments.